SHARES in New York Stock Exchange-listed Manchester United have risen more than 20pc since the start of the year. It's one reason why yesterday's sacking of David Moyes from the touchline may not translate into changes in the boardroom – at least not yet. Like Moyes, executive vice-chairman Ed Woodward, who is effectively the chief executive of Manchester United plc, took over the top job last year. His reluctance to shell out cash on new signings last year is seen by many as at least part of the reason for this year's decline. And like under-performing sports managers, executives in US-listed firms tend not to get to stay around if their results fall below par. But Woodward's position looks far more secure than that of his erstwhile manager because Manchester United's financial results are far more impressive than those on the pitch. 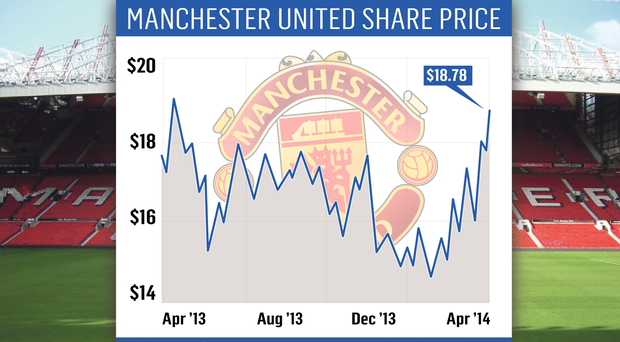 At the start of this year shares in Manchester United traded at $15.34 (€11.12) each. Last night the stock closed at $18.70 (€13.56) a share – close to a 12-month high, and up a dollar from Monday's close following confirmation that Moyes is to go. In its most recent three- month financial reporting period, the club posted record revenue. That helps explain why Manchester United shares have risen sharply at the same time as its sporting results were reaching crisis levels. Mind you, the financial resilience is in part because some of the club's biggest money spinners are contracted well in advance, so it will take time for sporting failures to hit the bottom line. For example, the club has nailed down a €405m seven- year sponsorship deal with Chevrolet that will start next season regardless of how the current season ends. A separate sponsorship deal with Nike is up in the air at the moment, however, and how and when that deal is sealed will be closely watched by analysts. Research by Bloomberg shows Manchester United's income breaks down as 38pc broadcasting rights, 28pc ticket sales and concessions, 24pc sponsorships, 7pc merchandise and licensing, and 3pc mobile and web partnerships and advertising. Merchandising, the area likely to take an immediate hit as younger, less loyal fans, eye up the shirts of alternative – more successful – heroes, accounts for a relatively small share of income. A 10pc drop in sales will only knock 1pc off the club's total income, says Bloomberg. Still as a business with very high fixed costs – all those premiership players' wages plus the drain of servicing hefty corporate debts – Manchester United Inc probably can't afford to allow assets to lie idle even if it is not as involved in competitive football as the fans would like. That means Wayne Rooney & Co can expect to find themselves touring the likes of Los Angeles and Kuala Lumpur for exhibition games. But whatever the situation pitch side, in financial terms the club is nowhere near that level of crisis – yet.